I have a laptop computer and use a wireless keyboard with it. A while back, the keyboard went really wonky: if I typed an A, I got a Q; I had to type Q to get the A (both lower and upper case). Same with W and Z. The right-hand side was even weirder: Type a period, get a colon, but type a colon, get M, type M, get ?, type ?, get + type + get _ type _ get ° … and on and on. When I tried typing numbers, I got alternate characters; for example, 567 looked like (§è and 890 was !çà. But the number pad gave me the numbers correctly. So, when I had trouble finding a period, I tried the period on the number pad. It gave me a comma. So of course, I reverted to the keyboard on the laptop: SAME THING! I can understand the wireless keyboard getting weird, but this baffles me. This is still happening. You would not believe how long it’s taking to write this post. While this is entertaining, it is not conducive to making blog entries, so I am waiting for it to get fixed before I continue. The time has come to start a project which has been waiting patiently for several years, through my knitting slump and some more-pressing designs — and almost two weeks of delays which have been chronicled here. I have never before run into so many delays and then gone ahead and started the project. Normally, by now, I’d have given up and gone on to one of the two or three others dancing in my head. But thanks to having a blog now, I will press on. Thank goodness for the blog! I’ve wanted to make the shawl for something like eight years, and to set it aside again in favor of a shiny new project would be a stupidity. CO 5 provisionally. K 42 rows, slipping the first stitch of each row pw, wyif. (K until there are 21 ridges ON EACH SIDE). 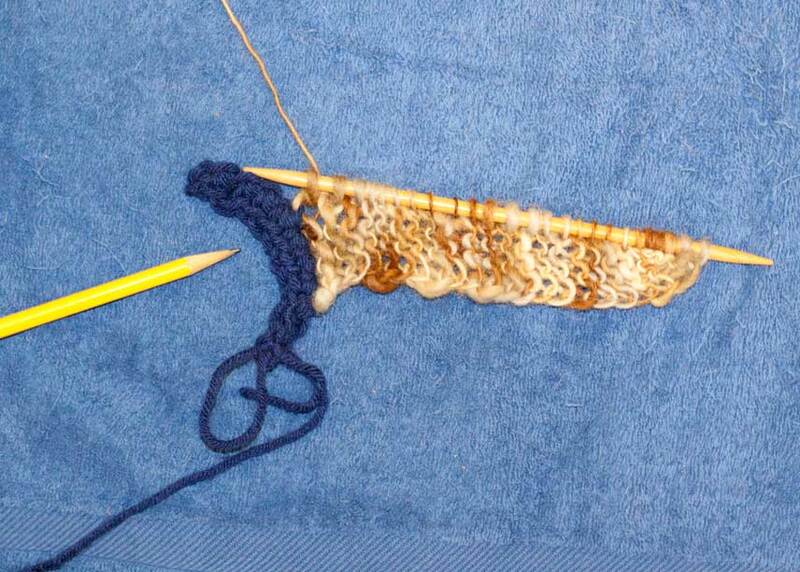 Picture A shows Neck Band border strip completed, ready to pick up along the side. Pencil points to where the sts will be picked up. Picture B shows the PUK process half-done. A: Pencil points to where the sts will be picked up. B: The PUK process half-done. Picture C shows Pick-ups completed. Pencil points to the CO sts, which will be gotten next. 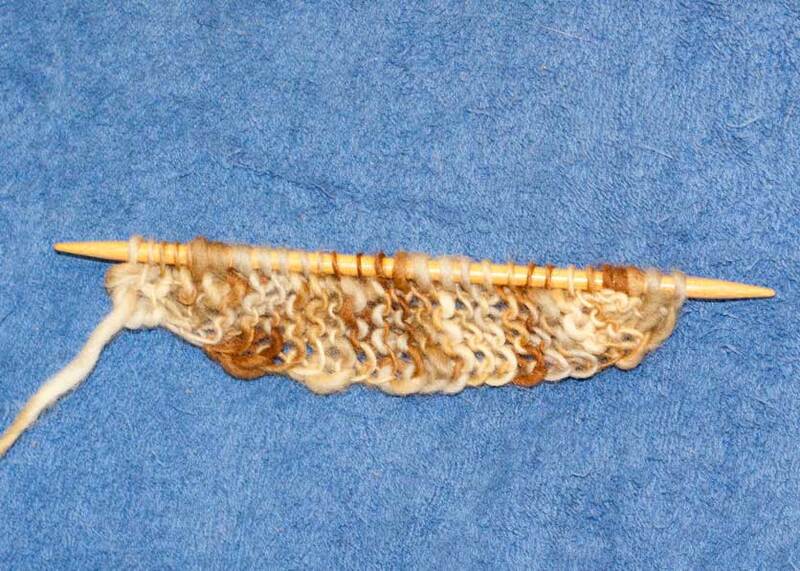 Picture D shows the Neck Band completed. C: Pencil points to the CO sts. D: Ready to continue down the shawl body! Place markers: Sl 1, K 4, PM. K 2, PM, K 16, PM, K 2, PM, K 5. 1st Border: Sl 1, K 4, PM. Row 1 (RS) — Sl 1, K 4, SM (Slip Marker). EM1, K 2, EM1, SM, K 16, SM, EM1, K 2, EM1, SM, K 5. Sl 1, K 1st Border, SM. EM1, K 1st Side to next marker, EM1, SM. SM, EM1, K 2nd Side to next marker, EM1. This kind of wording will be useful later, as the various parts grow. Row 2 — Sl 1, K 4, SM. Work (K2,P2) across to 2nd Border. SM, K 5. In other words: Work 1st Border, work (K2,P2) across to 2nd Border, work 2nd Border, slipping markers as you come to them. Row 4 — Work 1st Border, work (K2,P2) across to 2nd Border, work 2nd Border, slipping markers as you come to them. Row 6 — Work 1st Border, work (K2,P2) across to 2nd Border, work 2nd Border, slipping markers as you come to them. EM1 — English Make-one or Elizabeth’s Make-one — Make an increase stitch by forming a backwards loop with the yarn and placing this on the RN. 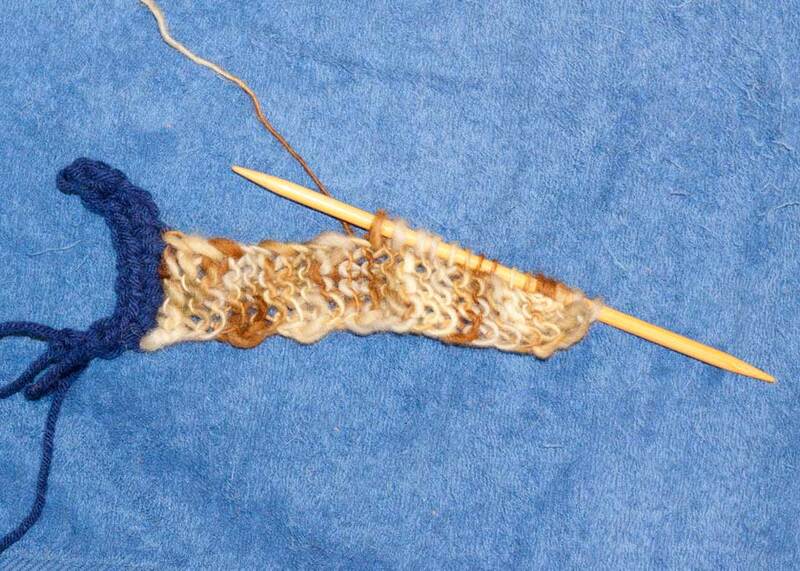 This does not make a hole, the way a YO (yarn-over) does, and works especially well with garter stitch, which is why Elizabeth Zimmermann preferred it for many things. According to Maggie Righetti, it is called English Make-one; since it is favored by EZ, I like to think that the E in my abbreviation can also stand for Elizabeth. Also, my designations 1st Border, 2nd Border and 1st Side, 2nd Side refer to these sections of the shawl as you come to them in the row you are working, and so will change from RS to WS. One of the reasons I thought a blog would be a good way to take my notes on this project is the pictures. I see other people’s blogs effortlessly strewn with photos of the works in progress. I had no idea that the need to insert pictures is not only not effortless, but can actually slow a project down. Did you know that those photos don’t just pop themselves into the blog as you write it? That you have to make a point of taking your pictures, which involves finding a good location, gathering your subjects, and using your camera? That you then have to move the photos from your camera to your computer? — No matter that your hard disk is nearly full, and the camera’s memory card is full, so you can’t take any more pictures until you either get the photos onto the hard drive (which will involve severe hard-drive purging) or buy another card. — That you then have to edit the photos? And then upload them to the blog? That when you have pattern and needles ready to go, and are itching to begin, you cannot start knitting your project because you need to get a shot of the unused balls to go with the post you wrote days ago about which yarn you chose? That if you’ve decided to take pictures outside because of the gorgeous way natural light has with yarn, it then rains 3 days in a row? I used to be a professional photographer, so you’d think some of this would be easy. And it is, to a certain extent; all the technical details are easily mastered, and I love the editing process. But my ego won’t let me just take a snapshot with my cell phone and upload it as-is. I have to fiddle with settings and arrangements and so on. Not that my pictures are works of art: I haven’t done much still-life photography, so these pictures that I’m slaving over don’t look any better than snapshots. I’m approaching the whole situation as a chance to learn product placement. Bear with me. Either my photos will get better and look more like advertisements, or I’ll give in and start uploading snapshots from my cell phone. I realized that I should have mentioned yesterday the name of the stitch pattern I’m using from BGW’s book, so I tried to look it up and discovered that I have unvented* a stitch pattern. I’m sure this one exists, but I can’t find it in the book, so for now, it’s new. The pattern in BGW’s Treasury is Sand Stitch, which is based on K1, P1 Seed Stitch, but with the WS rows done in K only. Because Jackie E-S’s Dolly shawl called for the shoulder shaping to be done on RS rows, I reversed the stitch pattern, so the K rows are RS, and all increases are done there, and the Seed Stitch patterning is done on the WS rows. However, before I settled on this pattern, I had looked at a lot of others, some of which had Moss Stitch patterning (K2, P2). So, when I finally decided that Sand Stitch was the pattern I would use, I inadvertently combined these, and ended up doing Moss Stitch patterning on the WS. Since it is temporarily a new stitch pattern, I will name it. Eventually, I will discover its original name, but for now it is, um, Rail Yard Stitch? … Maybe just Rail Stitch. Row 2: *K2,P2. Rep from *. Row 4: *P2,K2. Rep from *. * “Unvented” is a term devised by Elizabeth Zimmermann (in Knitting Without Tears?). Its premise lies in the knowledge that when we knitters “invent” something that is new to us — a technique, pattern, etc. — we are probably creating something which has been invented before. 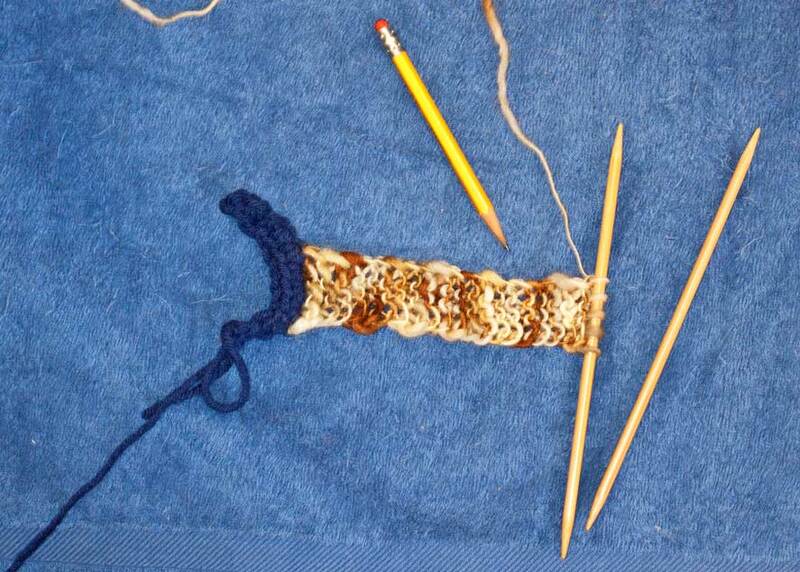 To EZ, it seemed like hubris to claim to have invented something, as if it was unique in the long history of knitting, when it had possibly been invented many times before, by many different knitters in many different places. 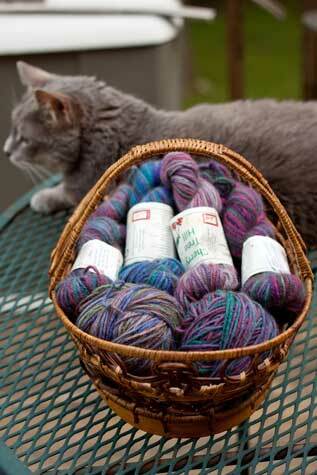 I am not crazy about garter stitch (sorry, EZ!) because it is too likely to stretch out of shape. And I am afraid that when the garter stitch stretches under its own weight, making holes between the stitches, it will let out the heat. Since I want this shawl to be warm, I am picturing it in a relatively solid pattern which, while still draping as a shawl should, won’t be too loose. So, I was thinking a nice Fabric Stitch or Linen Stitch would give a solid, woven-looking fabric. Then I realized that it probably wouldn’t have enough drape for a shawl. So I got out the stitch books, and swatched a little, and came up with one from BGW’s Treasury* which I think will work. On the right side, it looks a lot like garter stitch. And on the wrong side, it looks like a different right-side pattern, so I never have to worry about fussing with how I put the shawl on — either side will look all right. Decision made. I just went and examined my needle supply. 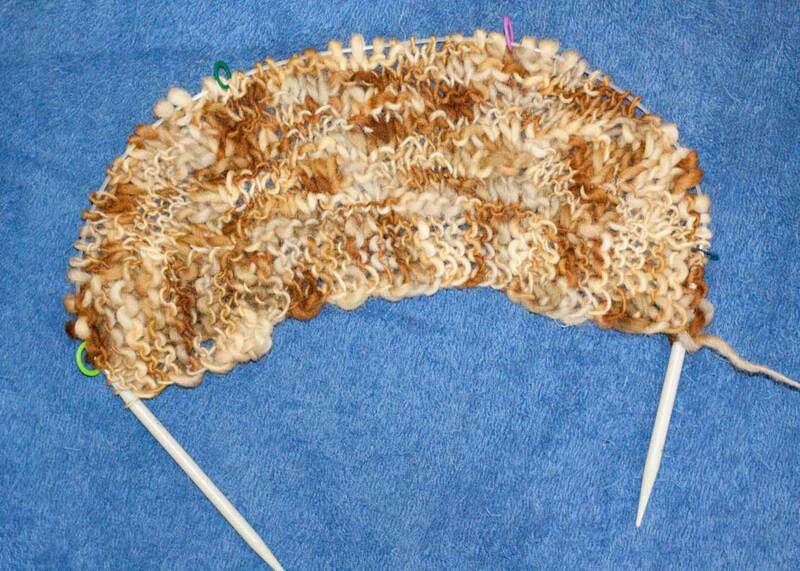 I have two sets of 60” circulars in size US7. All my 6s and 8s are in use in other projects, and I’m pretty sure I don’t have any of those longer than 29” anyway. So, US7 it will be. Edit: If you want a link to this book, that would be here. Scroll down the page a bit (their website is a little low-tech). This book is the blue one.